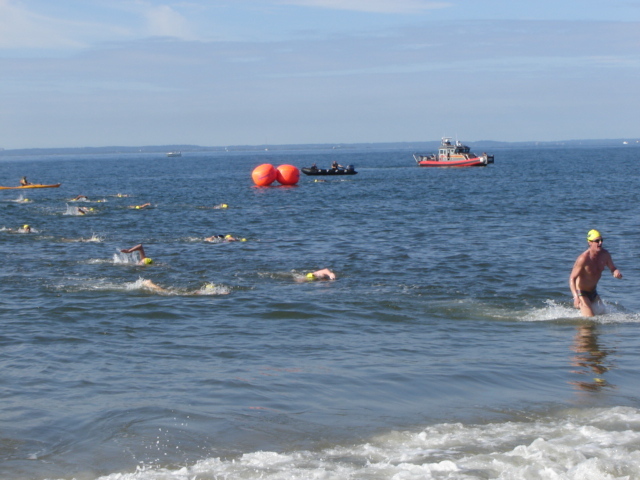 Another summer weekend in New York, and another open water swim race. 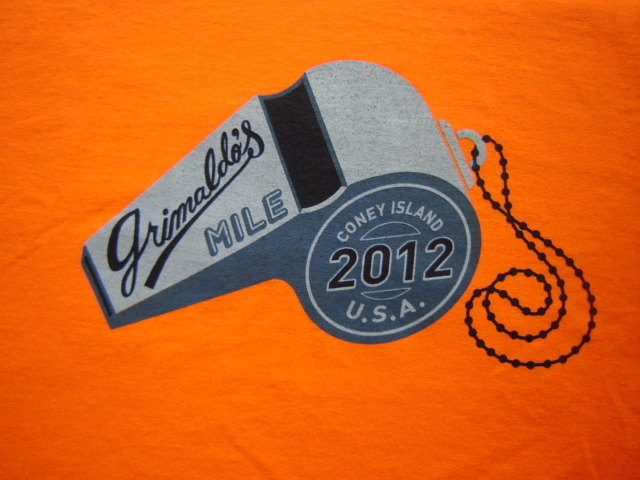 I had entered a swim run by CIBBOWS at Coney Island, known as Grimaldo’s Mile. I had been swimming with the CIBBOWS group on weekend mornings since I arrived in New York, and I found them a warm and welcoming group of open water swimming enthusiasts. 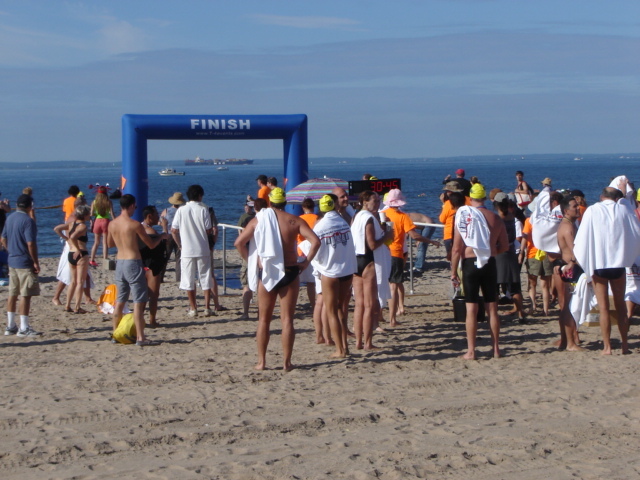 The race is named in honour of Grimaldo Medrano who was a New York City lifeguard stationed at Brighton Beach. He realised that the CIBBOWS people could be trusted to swim out past the rock jetties that line the beach. He convinced his fellow lifeguards that they should not wave the CIBBOWS back into the safety of the jetties, but should allow them to swim along the beach for training purposes. Consequently this group started to thrive, and were seen as a quirky part of the Coney Island scene. Tragically Grimaldo died at the age of 34 from lymphoma, but his name lives on with the CIBBOWS meeting place on the beach named in his honour. And of course the swim is also named after him. 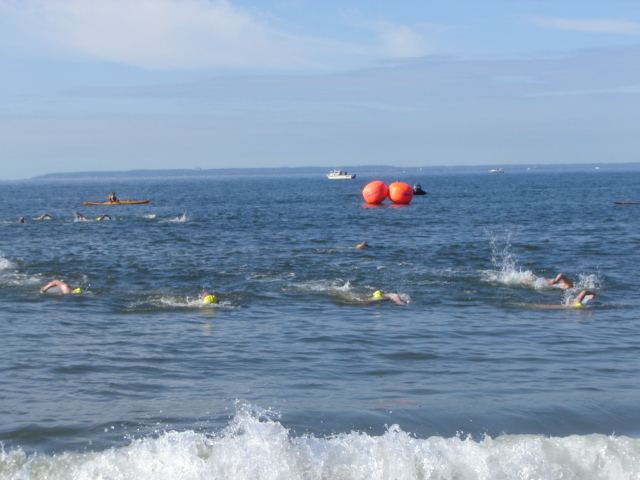 The actual swim is one mile long (or 1.6 km). It starts near the pier in Stillwell Avenue at Coney Island near the amusement parks, and finishes near the Shorefront YMCA at Brighton Beach. The instructions for swimmers were quite straight forward. 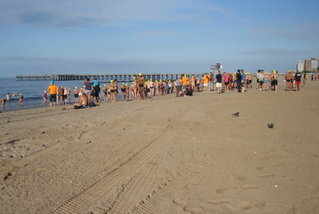 Start on the beach, swim out to the orange buoy, turn left and swim along the beach for one mile. At the next orange buoy turn left again and finish with a run up the sand. To make things more interesting, there was only one wave for the start. I had visited the beach the day before the swim to do some more practice in the open water. I had been doing my two and a half miles in Sunset Park Pool four mornings a week, in preparation for the Governor’s Island swim at the end of July. However, I wanted to get down to the beach one more time before the race to make note of landmarks and the like, so I went for a swim on the Saturday. Upon my arrival at the beach I was greeted by conditions that were described by the locals as quite rough. Well compared to my experience over the last month I would have to agree, but to me they looked just like home on a summer afternoon. There was a small shore dump of around half a metre, and the breeze was strong enough to create a bit of chop in the water. It reminded me of the chop you get at Bondi on the far reach of a swim. I had no intention of swimming hard, so only did about a mile and a half swim, relishing the conditions. I was also hoping that they would stay the same for race day tomorrow. Race day was warmer, and calmer. A short trip on the Q subway got me to the registration point at the Shorefront Y by 6.45 am. After I received my brandings (race number on each arm and one shoulder-blade), the goody bag, the bright orange t-shirt, the swim cap and timing chip I glanced over to the water. My heart sank to realise that the conditions of yesterday had evaporated and there was no wind and no waves. Oh well at least that would be fantastic conditions for the locals, and it would make it a fast swim. Another part of me was relieved that I could swim in calm water and could get a fast time. A school bus had been organised to transport the swimmers down to the start line, but my wife and I decided to walk down along the famous Coney Island boardwalk. It was a beautiful morning with no wind, a mirror-like surface on the water, and few people around. The beach does not start getting busy until the lifeguards come on duty at 10 am. We did notice a group of people on the sand having what we guessed was a baptism ceremony. Several other competitors also chose to walk down and we had conversations with some of them about the day. After the twenty minute walk we arrived at the start line just as the first bus load arrived. I wanted to do a warm up swim so I went into the water to get my shoulders working and to try to assess whether there was any current. As I entered the water I found L from CIBBOWS coming out, she had swum the course from the other end as a warm up. I had swam with her a couple of times before and we swim at a similar pace. She had also beat me at Liberty Island swim by a fair way, so I was hoping to get closer to her this time. The water was wonderfully warm, and there was virtually no water moving around. I could not discern any current out wide. We lined up on the beach to hear the safety instructions. I have to realise that in this town open water swimming is a niche sporting activity, as most of the locals have been brought up to believe the water is filthy and that you only swim at the Hamptons or other places well away from New York City. If you do go to Coney Island you paddle by the shore, and you certainly do not swim around. I looked around the other swimmers, and there were quite a few who looked nervous, but I was encouraged to see them having the strength to overcome their nerves and commit to the event.I had been talking to L and her friend M, who was competing today for the first time. He was worried about the fact that all of us would be starting together. I told him to either get to the front and swim hard, or go to the side or back and get into clear water as soon as possible. The aim is to get into your rhythm early so that you do not waste energy dealing with a lot of swimmers around you. I also advised him to draft other swimmers whenever he could as it would save energy, and you have to hope that they swim in a straight line. He asked me about navigations, and I told him that the easiest way is to lift your head while breathing and look ahead. I told him that the sun would play tricks on our eyes today as we were swimming straight towards it. The start was on the beach, and I realised that the left side of the start line was better as it was closer to the turning buoy, and there were no rips or sandbanks or swell to deal with. The gun went and I raced into the water, enjoying the chance to have a dry land start for a change. I did a few porpoise dives and quickly got into stride and clear water. I looked to the right and saw that most of the pack were already behind me. I turned at the buoy and tried to pick someone I could draft off. Soon enough I found someone swimming slightly faster than me who seemed to be able to swim fairly straight. So I got a few feet behind him and enjoyed the sight of his bubbles leading me to the finish line. I looked left frequently to see the landmarks, and we soon passed the Wonder Wheel, the New York Aquarium, and the first of the apartment blocks. However, as we approached the half way point, my guide started to slow down. I decided to swim around him and to try to catch the next group of swimmers, who were around thirty metres ahead of me. By this time I realised that there were not many swimmers ahead of me, which is an unusual position for me in a race. So I concentrated on my stroke and technique and enjoyed the smooth conditions, and soon caught another swimmer. She was swimming quite fast so I got in behind her, even though she was having problems with her navigation. I tried a few times to get around her, but she was too fast, so I resigned myself to conserving energy for the finish. We soon passed Grimaldo’s Chair and I knew we only had a short distance to go. I sighted the turning buoy and was happy that I was heading directly for it. I was slowly edging closer to my guide and thought that maybe I could pass her and get onto the feet of the swimmer in front. But she must have heard my thoughts, as she increased her speed whenever I approached. Soon enough we turned the buoy and we both sprinted the 100 meters or so to the finish line. As we stood up in the shallows she was just in front of me, and there she stayed until we ran across the finish line. I noticed my time was just under thirty minutes, which was not bad for a one mile swim by someone on vacation. Once I crossed the finish line I looked up expecting to see a large group of swimmers who had already finished. I was amazed that there only appeared to be about twenty or so with their courtesy towels wrapped around them. My wife who had caught the school bus back from the start line, told me that there were not many ahead of me. Maybe I was a chance to get another placing in my age group. As we waited on the beach I talked to L who had finished just ahead of me. She is a big fan of Total Immersion, and I was impressed that she was not in a squad, but just swam for the enjoyment. M finished behind me and he was over the moon about the swim. He had taken my advice and started towards the back, but was soon passing people. I told him that he could not get better conditions for his first open water swim, and perhaps he should consider doing some other ones. After a while we all gathered at the Y for the food and the entertainment. Once the results were posted I found I had finished in 26th position in the non-wetsuit category. This is the highest placing I have ever achieved in an open water race anywhere. So I was very happy with that. However, of those 26 swimmers ahead of me, there were four in my age group – 45 to 49. So I had come fifth, and I was disappointed that I had not repeated my results of the Brooklyn Bridge Swim. However, I did console myself that my age group is often one of the most competitive ones, and that I should concentrate on my overall placing. As we left the ceremony to catch the subway, I had time to think on the CIBBOWS organisation. They are a fun and friendly group of ocean swimmers who open their arms to swimmers from around the world. I felt like I belonged here, even though we had only been in town for five weeks or so. I would miss this sense of community upon my return home. My next and last swim will be Governor’s Island in a week. I was looking forward to that one too. You flatter me comparing me to the almighty Spot. Believe me we would love to stay longer.